Cuban exiles are outraged after a constitutional referendum went up for a vote Sunday. NBC 6 Reporter Laura Rodriguez explains. Cubans were asked Sunday to send an overwhelming message of approval for the country's communist system as its founding generation of geriatric former guerrillas cedes the public spotlight to a new class of middle-aged bureaucrats. Voters were expected to overwhelmingly approve the draft of a new constitution that preserves the single-party socialist system and centrally planned economy while making some updates. The new constitution recognizes private and cooperative businesses alongside state ones, creates the posts of prime minister and provincial governor, and introduces the presumption of innocence and habeas corpus to the justice system. The only open question was how overwhelming the "yes" vote would be. The current constitution was approved by 97.7 percent of voters in a referendum in 1976, the peak of a system dedicated to displays of national unity achieved through a blend of consensus-building and coercion. Forty-three years later, Cuba is one of the world's last communist nations, its economy is faltering, its population shrinking and the percentage of "no" votes is expected to be small but significant when results are released Monday. President Miguel Diaz-Canel's government waged a non-stop campaign promoting a "yes" vote and tarring those voting "no" as counterrevolutionaries and enemies of the state. "I came to vote for the constitution of my country, for the rights we Cubans have to defend, for continuity and our revolutionary process," said one voter, Januarys Molina, 34. Aside from a few independent websites, all Cuban media is state-run and the airwaves were filled with messages urging people to approve the new constitution for the sake of continuity on the island. In recent days, those messages were mixed with words of support for Venezuelan President Nicolas Maduro as tensions rise between Cuba's main ally and the Trump administration, along with Latin American allies who support the Venezuelan opposition and its attempt to force aid into the country. "We're living a moment of imperialist menace," Diaz-Canel told reporters after voting Sunday morning. "What they're applying in Venezuela can be applied in any place in the world." Diaz-Canel's predecessor, 87-year-old Communist Party head Raul Castro, was shown voting in footage on state TV that didn't include comments to state media on the scene. The largest block of "no" votes could come from the growing ranks of evangelical Christians in Cuba, who object to language that eliminates a requirement for marriage to be only between a man and woman, paving the way for a future legalization of gay marriage. Cuban dissidents reached out to the growing number of people who have internet access on the island, urging them to vote "no" or boycott the vote altogether. Both Florida Sen. Marco Rubio and Vice President Mike Pence attacked the vote as illegitimate in Twitter statements Sunday. 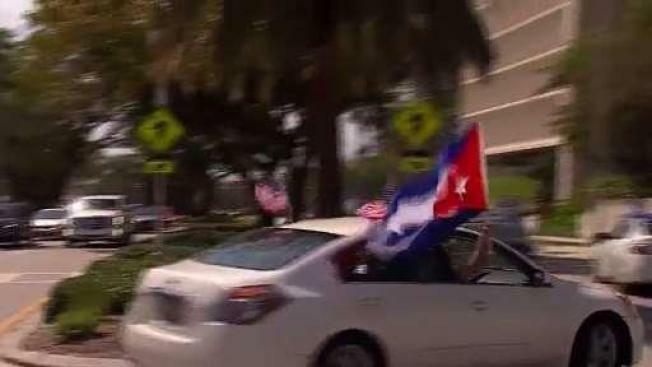 In Miami, many Cuban exiles gathered Sunday to protest the referendum. "We're here to protest the mega fraud that the Cuban regime is committing with the constitution," said Ramon Saul Sanchez, a Cuban exile. "We've been suffering for six decades from this regime that deprives us of all rights and divides us as a nation." The Cuban community also stood in solidarity with the people of Venezuela and Nicaragua. "We will not stop here in the United States supporting the efforts of Cubans, Venezuelans and Nicaraguans to try and find liberty in their own countries," said Mayor Francis Suarez.